Minimum of 2 nights stay. Our 1969 home B&B located on top of the hill was extensively renovated in May 2016 with an extra bedroom and bathroom added with the living and entertaining areas all open space. Extraordinary sea view's from all rooms with comfy beds, new deck for relaxing and BBQ for guest use. Caters to couples, single adventurers and business travellers. Free Wi-Fi, Toiletries, Bathrobes & Slippers, Non-Smoking and GF Breakfast. Public Transport at the door, near golf courses, close to city centre, parks, heated public pool on St Clair beach, great Restaurants & Cafes, Penguins & Albatross Colony 30 minutes away, Day Trips at Taieri Gorge Railway, Saturday Farmer's Market, 2.5km to Toitu Otago Settlers Museum, 6km to Forsyth Barr Stadium, 22km to Dunedin Airport. 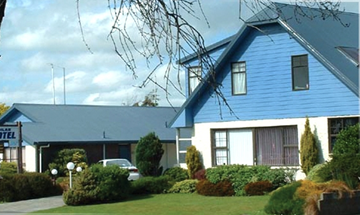 A warm welcome awaits visitors to Invercargill who are wanting a motel unit very close to the central city. 9 self contained units 5 with wheelchair access - breakfast available. Situated close to the central city, 9 motel units 5 with wheelchair access. Breakfast available. A warm welcome awaits all visitors to Invercargill.